Jonathan Borofsky, Human Structures (detail), 2010. On loan from the Vancouver Biennale; Joe Fafard, Mahihkan, cast 2016. 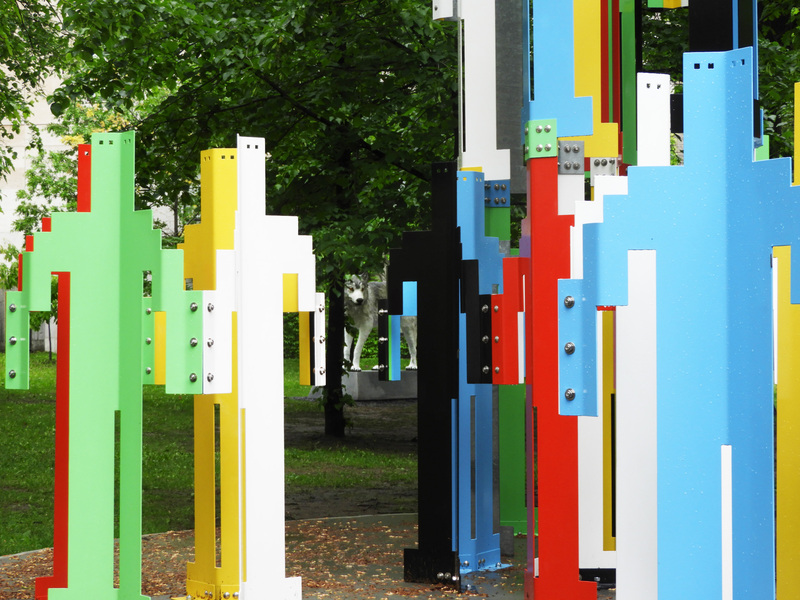 On loan from Fafard Sculpture Inc.
Join us for a 45-minute tour of the Public Art on McGill's downtown campus. This tour is designed for members of the McGill and Montréal community, prospective students and their families, and general visitors alike, and includes such highlights as the Three Bares, the James Sculpture Garden, the sculpture on Lower Campus, and the Lichtenstein Tapestry. Tours leave from the Welcome Centre. Every Wednesday at 12:00 p.m., rain or shine, all year round! Reservations are not required. Feel free to vanessa.difrancesco [at] mcgill.ca (contact us) for more information about the tours.